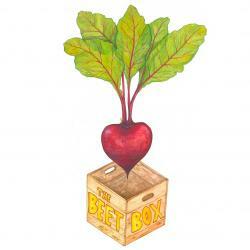 The Beet Box is growing! As our business expands, we're seeking a manager to oversee up to 12 crew at our busy festival booth. We serve gourmet vegan street food made from original recipes using locally sourced ingredients. Our beet inspired menu includes burgers, salads, sandwiches, smoothies, smoothie bowls, juices, elixirs, breakfast items and raw desserts. We travel to some of the largest festivals in the Eastern United States and serve up to 1000 meals in a day, so if you thrive in a fun, fast paced environment and have experience working with plant-based food you may be the person we're looking for. Our ideal candidate enjoys traveling and being part of a close team. They are comfortable in a leadership role while working and traveling with the crew. They are a good problem solver, calm under pressure, and are able to inspire others from a position of authority while keeping a fun friendly atmosphere. Our crew are awesome, and we love what we do. At each festival you'll liase with the event's vendor coordinator and their team, building on the good relationships we have with them. Most of them are great to work with. You'll assist and guide the booth/kitchen construction and deconstruction at the start and end of each event. You'll be a people person who gets along well with all walks of life. A knowledge and interest in wellness and nutrition is ideal. Our recipes are designed for optimum health and include many superfoods and potent natural medicines. We have something for everyone including nut free, gluten free and low carb options. We like everyone at The Beet Box to be knowledgeable about the ingredients on our menu in order to answer any questions our customers have. You'll be responsible for overseeing others in maintaining the cleanliness of the booth. You'll be aware of health and safety practices (they vary State to State) and ensuring staff comply with local requirements. You'll meet with health inspectors at each event and will ensure they have everything they need. Ideally you'll have, or be prepared to study for your Food and Safety / Allergen Awareness certificates which are required in certain States. You'll be responsible for overseeing quality control so that everything served at Beet Box is consistently delicious and well presented. Your front of house and line cooks need to work together to ensure every plate is clean, appetizing, and the correct portion size. The manager's role is to ensure these high standards are maintained. You'll be in charge of records and stocktaking using our POS system and also for keeping track of all expense receipts for the business.You'll distribute tips evenly. You'll have the ability to delegate work effectively to ensure the smooth running of the booth. This is an opportunity to work with an eclectic mix people in a unique environment. If you are self-motivated and energetic with good attention to detail this could be your dream job. We're a grassroots business that aims to support organic farming and the local food movement while offering vegan food in places it was not previously available. We keep very high quality standards because we aim to inspire people with the realisation that healthy plant-based food isn't a deprivation, it's about eating the most delicious food you ever tasted and it makes you feel great too. We hope you'll share our passion. You'll sample delicious plant based meals from our menu and have the opportunity to expand your knowledge of plant based cooking. We like our crew to feel vibrant and be well nourished. We love the food we serve and we're excited to tell people about it. This is a full time position with the potential for growth within our company as we expand into product development, international plant-based retreats and more. Clean driving licence. Non smokers please. No pets on the road. The Beet Box is a food vendor serving vegan street food, juices, elixirs & raw desserts at festivals across the Eastern United States. Founded in 2015 by Chef Bamboo and his English wife Jojo. We believe in putting love and good vibes into the food we make. We love the what we do, and the crew we work with. We work hard, have fun and take care of each other.